I have a long interest in insect jewelry (1993, 1997, 1998, 2001). No cultural group makes as many representations of insects as do Native Americans, as butterflies and dragonflies have symbolic importance to many tribes. On our road trip to New Mexico in July, I was able to see and photograph some wonderful antique examples of butterfly pins and one dragon fly pin from those on at exhibit at Jonathan Hill’s booth at the Traveler’s Market in Santa Fe, when I gave a lecture on Prehistoric Southwest Jewelry. Unfortunately, since the Market was closed, there were no lights on in any of the displays, so I had to shoot at high ISO through the glass cases. Thus, these images are somewhat pixalated and not very sharp. These vintage pieces show styles and techniques that one rarely sees today and have a terrific animated quality, although they are less anatomically correct than contemporary examples of such jewelry. I looked through our considerable collection of books on Southwest jewelry and could not find much on these vintage pieces. I decided to ask John C. Hill, Scottsdale gallery owner and appraiser for help. “The inlay piece (in first photo) is Zuni and likely from the 1930s. The inlay is usually made by Zuni craftsman and the silver work by Navajos. But generally called Zuni Inlay. The butterflies could be Navajo, most likely, or Hopi, because there were far fewer Hopi smiths than Navajo. These generally are after the WWII GI Bill. The Zuni inlay is rarely marked. The butterflies would be marked more often. But again generally Indian silver work is not marked before 1970”. We also toured the very impressive Jan and Lauris Philips Center for the Study of Southwestern Jewelry with curator Cheri Falkenstien-Doyle of the Wheelwright Museum. I was able to photograph a few vintage butterfly pins, as well as more contemporary butterfly and cicada pins by well-known Native American jewelers. Just in this small sample of insect jewelry, one can readily see the evolution of styles, materials and techniques, which make such jewelry so collectible and of interest to jewelry historians. Liu, R. K. 1993 Butterfly Jewelry. Ornament 16 (3): 16-17. —1997 Dragonfly Brooches. Ornament 20 (4): 24-25. —1998 The Symbolic Importance of Insect in Jewelry. Ornament 22 (1): 38-43. —2001 The Symbolic Importance of Insects in Jewelry. Transactions of the American Entomological Society 127 (2): 167-171. Vintage Zuni inlay butterfly at Jonathan Hill’s booth, in Traveler’s Market, Santa Fe. Photographs: Robert K. Liu/Ornament Magazine. Hopi or Navajo butterfly pins, of silver, with stampwork, probably date from the 1930s to 1940s. An example is in the Doneghy Collection at the MIA, Minneapolis. The small inlay butterfly is most likely Zuni. Vintage silver dragonfly and two butterflies, some set with turquoise, all with stampwork. Hopi or Navajo, all courtesy of Jonathan Hill, Santa Fe. Additional butterfly pins, of later date, from Jonathan Hill booth. Silver one is set with turquoise and silver bosses, while other has bezel-set wings of turquoise. 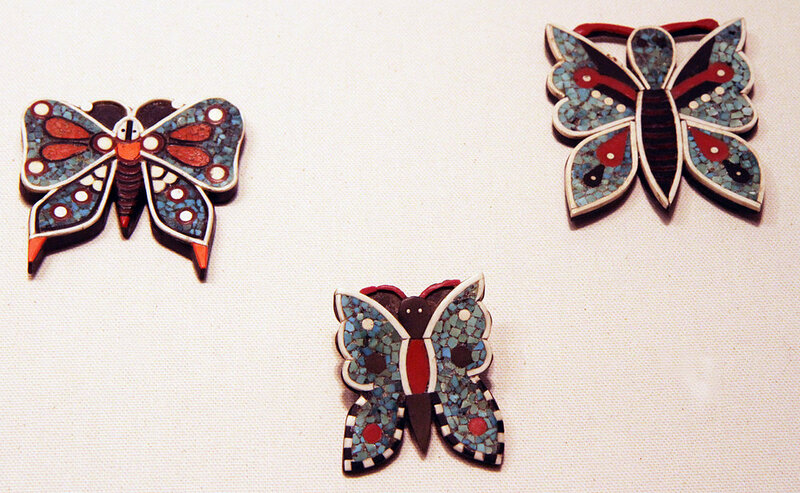 Butterfly pins, probably from Santa Domingo Pueblo and possibly made from late 1920s to 1950s. Often called Depression jewelry, as they were made from non-precious or low-cost materials like phonograph records/battery cases, other plastics and gypsum, as well as turquoise. Because we walked through the Philips galleries rather quickly, due to the volume of material, I did not have time to record the captions on the displays. These bear some similarity to polymer butterflies made in recent years. Courtesy of the Wheelwright Museum, as are the last two images. A butterfly with turquoise wings, most likely also made by Liz Wallace, but I cannot be sure. Again, the shadows cast by the exhibition lighting adds to interest. Contemporary cicada brooch of turquoise and gold (?) by Liz Wallace; note how the shadow enhances the appearance of this jewelry, seemingly suggesting that it is in flight. Cicada imagery in jewelry was used by both ancient Hohokam and Navajo (Liu 1998, 2001). The cicada is among Wallace’s favorite insects and also of importance in Chinese culture.